This chanting of the Hare Krishna mantra is enacted from the spiritual platform and thus this sound vibration surpasses all lower strata of consciouness - namely sensual, mental and intellectual. When a Krishna Conscious person is elevated to a responsible position, he never becomes puffed up. Just like a tree when over-laden with fruits becomes humble and lower down. Similarly, a great soul in Krishna Consciousness becomes humbler than the grass and bowed down like the fruitful trees because a Krishna Conscious person acts as the agent of Krishna, therefore he discharges his duty with great responsibility. The Srimad-Bhagavatam states that any bona fide preacher of God consciousness must have the qualities of titiksa (tolerance) and karuna (compassion). In the character of Lord Jesus Christ we find both these qualities. 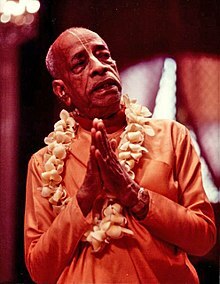 By the grace of the spiritual master the cloud of the mercy of the Personality of Godhead is brought in, and then only, when the rains of Krishna consciousness fall, can the fire of material existence be extinguished. First birth is from your parents, but real birth, real life, begins when one accepts a bona fide spiritual master and renders service unto him. Then the path is open for going back to home, back to Godhead, to live eternally in full knowledge and full bliss and in association with the Supreme Personality of Godhead Himself, Lord Krishna. When a pure devotee or spiritual master speak, what he says should be accepted as having been directly spoken by the Supreme Personality of Godhead in the Parampara System. Humility means that one should not be anxious to have the satisfaction of being honored by others. A devotee should be fixed in the conclusion that, the spiritual master cannot be subject to criticism and should never be considered equal to a common man.